Margate Catholic Church community before 1947 had no church of their own and had to travel to Port Shepstone to attend Mass and partake in parish activities. In 1947 a hall was built on plots 6/8 in Hibiscus Road, Margate, where services were held and eventually in 1969 the first Margate Parish Council was instituted. One of the first objectives of this Parish Council was to build a church for the Margate Catholic community and so the wheels were set in motion to make this a reality. In December 1972 Margate became an independent parish with a congregation of 69 adults and 33 children and still operating out of the hall in Hibiscus Road. Although the facility could cope with the local parishioners, it proved inadequate when the holiday makers arrived and so the desire and need for church big enough for the needs of the community remained a priority. After searching for a suitable site on which to build a church, two acres of land were eventually purchased for R 13293 in Johnny Ralph Crescent. In August 1973, the roof wetting ceremony of our present church was celebrated and on 3rd October 1973 the church was blessed and the first official Mass celebrated. The church building incorporated a “hall” situated upstairs where social events and activities could take place. Over time this arrangement became increasingly problematic and after a successful fund raising drive, building a new hall next to the church began in 2004. Today the church can accommodate its regular parishioners as well as the many holiday makers that regularly visit Margate. The church hall is a most useful facility and is regularly used for all manner of events. 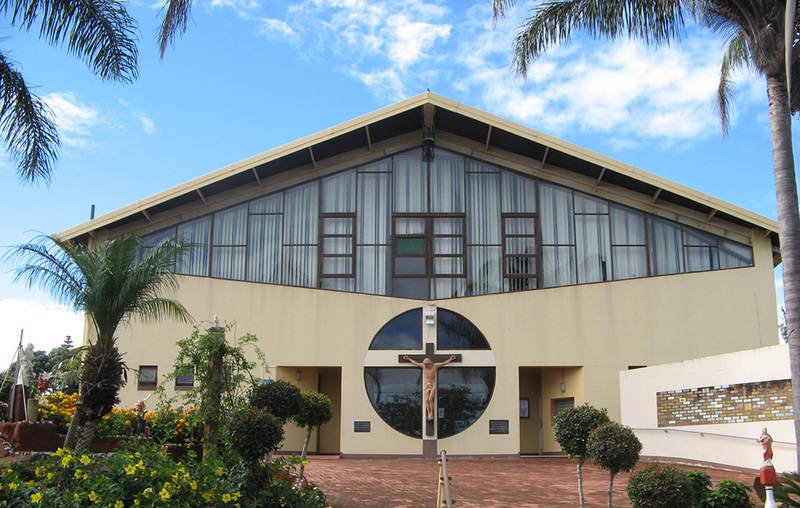 The parish is a member of the Diocese of Umzimkulu under the care of Bishop Stanislaw Dziuba and who is based in Harding. Priests of the Parish: Our Lady Queen of Peace.